We have prepared this "welcome" page in English to share news and background information about our Korean-speaking ministry and worship. 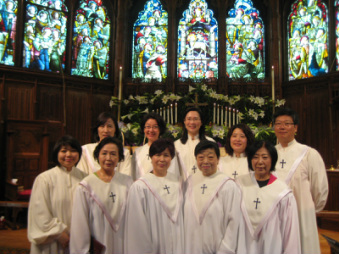 Korea has had Anglican (Episcopal) congregations since 1890. In 1993 the Archbishop of Canterbury recognized and installed a newly elected Primate (head of church) and handed jurisdiction to him, making the Anglican Church of Korea a Province of the Anglican Communion. There are presently three dioceses and four religious communities in the country (population 22 million) as well as an Anglican University. We invite you to worship with us. Holy Eucharist is celebrated on Sundays at noon. Even if you're not bilingual you may be able to follow the service if you are familiar with the Episcopal Church's Book of Common Prayer liturgies. Or, consider attending as an observer. We would be delighted to welcome you. Many parishioners are bilingual. Our Sunday morning services are always followed by a hospitality luncheon of Korean specialties prepared by families of the congregation. Join us! We will be pleased to meet with you to become acquainted and provide further information about the congregation. We have a Companion Congregation relationship for mutual prayer and support with the Jeju Anglican/Episcopal Church in Jeju, an island community in South Korea. 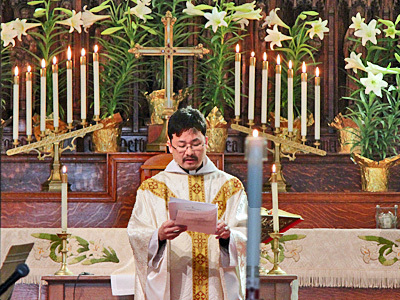 The Jeju Anglican/Episcopal Church offers liturgical worship with candles, responsive readings, songs, and prayers. The service is in Korean, but the church provides English-speakers with a printed guide in English. Sunday service is from 11:00 a.m. until 12:00 noon, followed by a luncheon at the church. How to get there: From the No Hyeung 5-way intersection (at "Outback Steakhouse") walk in the direction of the ocean. At the end, turn right. The church is behind the bus stop. It's an older building remodeled and turned into a church. Visit the All Souls' Jeju Anglican/Episcopal Church website (published in Korean). For a delightful introduction to Korean cusine and cooking and culture, a friend of St. Joseph's Church and a New Jersey caterer, Carole Lee, recommends the American Public Television series and DVD and book entitled "Kimchi Chronicles." The DVD and book are available in supermarkets and from Amazon.